Barbour: Justice Really Important, If You Have Time for It! 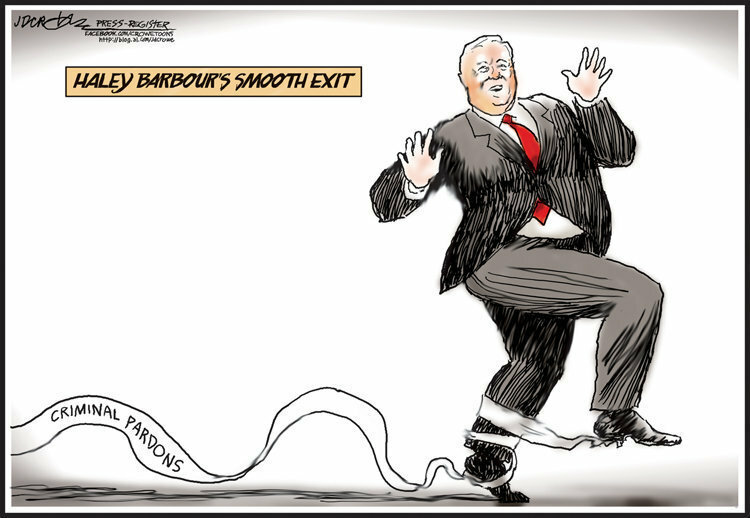 Barbour said he couldn't really "look at" pardons for eight long years because he was busy with "Katrina and other things" (President Reagan, Barbour's "hero," evidently, was not nearly so busy). Good thing Barbour added "the other things" in there. Otherwise, eventually, someone would have asked, "Mr. Barbour, how many people did you pardon between January of 2004 (when you took office) and August of 2005 (Katrina)?" The answer is: ZERO. Almost 600 days of nothing! Zip. Notta. Incidentally, the loafer Reagan granted more than 80 pardons in his first 600 days as President. But that is because it only took Reagan 65 days to start granting pardons. On the other hand, the tireless workhorse and endlessly distracted Mr. Barbour needed 1,649 days (four and a half years)! Yes, and the one, single day, that Barbour was finally able to come up for air just happened to be his last day in office. Oddly enough, the God of most Mississippians (and of Christianity) appears not to be so busy, and is always ready to forgive (Psalms 86:5). Stee-rike two on Haley Barbour's PR rehabilitation tour.